Over the past several months I have been making a strong effort to do what I can to preserve the environment. I wrote about taking the metro more, which I have been pretty good at, and my use of plastic bags in stores, of which I now have 4 different reusable bags to my name. 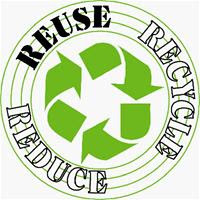 I am a big fan of the 3 R's of the Environment: Reduce, Reuse, and Recycle! I do my best to apply these principles to all aspects of my life. I work on reducing the amount of things that I consume that I don't need, reusing everything that I can, and recycling everything that is accepted. I was recently reading my townhouse newsletter and read an article which said that people were not following the proper precedures when putting out their recycling. The article said that if we didn't follow the guidelines, the contractor who picks it all up, will just trash it. All of the items that can be put out on the curb to be recycled were spelled out in good detail. As I was perusing the list, I realized that there were a number of things that I was not doing correctly. There are a lot of plastic items that I have been trying to recycle that Arlington County does not accept! I wanted to try to find out a little bit more about this, so I emailed the guy who I get a lot of my green info from, The Green Miles. He said that according to the county, it is not cost effective to recycle all different types of plastic, only #1 & #2 small neck bottles. He also pointed me to a website with some great information, Stoneyfield Farms. They have a long description about the packaging that they use for their yogurt containers and it contains info about why theirs, and other plactic containers like theirs, are not recyclable. However, their website has more important info in it than just that. They talk about the whole process of packaging and their product containers. I think a lot of what they have done shows a great mindset. One that every company that makes consumer products needs to follow: lessening the impacts of their products on the environment!! They worked with the University of Michigan’s Center for Sustainable Systems to improve the environmental performance of their packaging. This includes the entire lifecycle of the product. Everything from "the cradle to the grave." They did not just look at the packaging that the consumer sees, but also the secondary packaging which protects it in transport to the stores. I think this is a very important issue, one that also causes a lot of waste and detriment to the environment. Performing a Life Cycle Assessment, like the one that Stoneyfield commissioned, is something that all businesses should go through to make their products more environmentally friendly. The Stonyfield webpage is a long read, but if you have any concern for the environment, I hope that you will read it and leave me your thoughts in the comments. **P.S. It has taken me several days to write this post, and in that time, the Green Miles has beaten me to the punch on posting the Stonyfield website. His post is a bit more of a Q&A post, so you should check it out as well!